The real sound of Singapore-styled Thaipusam music: Vel, Vel, Vetri vel! 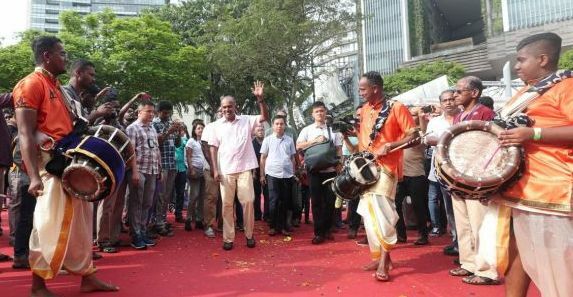 THE sound of Thaipusam music genuinely filled the Monday air as the first time in 46 years, as percussion instruments were allowed and Minister K. Shanmugam (above), too, wanted to do an Indian jig to celebrate the spirited Hindu occasion. He hailed the new music rules, wherein he played a major role in reviving the drum-beats, as “very positive” especially after listening to feedback from the Hindu community. “Vel vel! Vetri vel!” “Vel vel! Vetri vel!” (short-hand for Lord Murugan’s full name, Velmurugan). Thaipusam, after all, is an exemplary south Indian festival where sound is at the core of the procession of the Hindu community. Regardless of one’s social status or specific community’s religious practices, Singaporeans and tourists participated in the procession from Little India to Tank Road. To me, the reverberating sounds heard at the temple and along the roads blend together a wide range of aural contributions from each distinct group to make up the sound of the larger Hindu community. In 1973, the playing of all music was banned after fights with competing groups. But over the years, steps have been taken to allow music during the four-kilometre kavadi-procession from the Sri Srinivasa Perumal Temple in Serangoon Road to the Sri Thendayuthapani.Temple at Tank Road. Wow, I truly felt a louder rousing Indian beat as besides the playing of devotional songs and music through loudspeakers at 35 spots along the route – 12 more than last year – the music was allowed to start an hour earlier, at 7am, and stopped at 10.30pm, an hour before the celebrations ended. He was among more than 250 kavadi-bearers and 8,600 devotees carrying pots of milk as offerings in the celebration to honour Lord Murugan, who represents virtue, youth and power, and is also the destroyer of evil. The kavadi-bearers were accompanied by musicians playing traditional Indian percussion instruments, including the ganjira drum and one of either a thavil, dhol or khol. More than 20,000 people, including family devotees of teenagers to senior citizens, took part in the procession, which attracted crowds of Singaporeans and visitors, clicking away at the colourful event. Minister for Culture, Community and Youth Grace Fu was the guest of honour at the celebrations on Monday morning where she visited both temples: Sri Srinivasa Perumal and Sri Thendayuthapani. The experience of Thaipusam 2019 was simply overwhelming. For Minister Shanmugam, his heart and soul would surely feel refreshed as he always believed that music has an iconic role in the festival, as every devotee sees it as a source of strength to continue walking. It may well tempt the Minister to carry the kavadi the next time around, wherein he, too, can dance to the upbeat music to experience the genuine soundscape of a Singapore-styled Thaipusam.